The Jerusalem Magistrate’s Court ruled today that the Siyam family must evacuate its home and its adjacent office for the benefit of the settlers. The settlers have been trying for years to obtain ownership of the house on the basis of all sorts of claims and documents, all rejected by the courts in lengthy and exhausting proceedings that lasted more than twenty years. 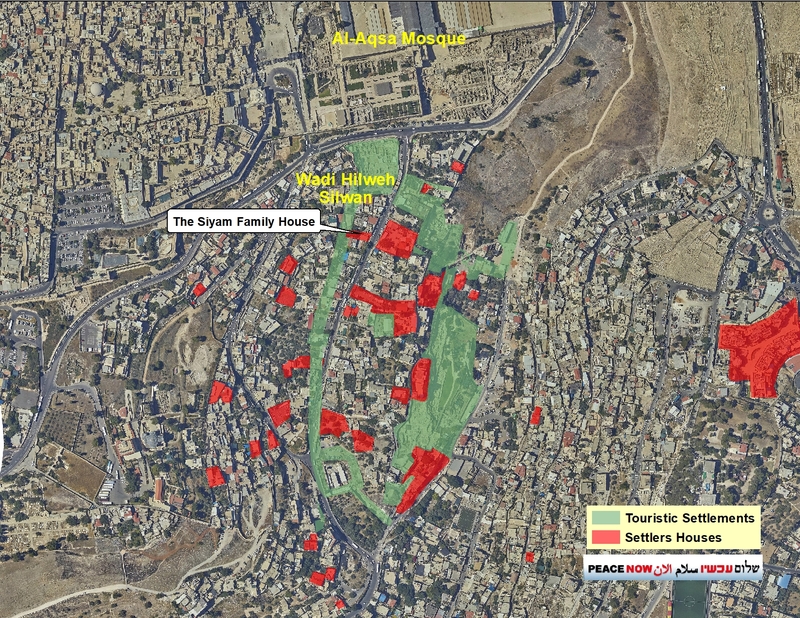 The house is located 250 m. south of al-Aqsa mosque, on the main road of Wadi Hilweh (Silwan), not far from the visitors’ center run by the settlers. The Palestinian family is intending to appeal to the District court against the decision. The settlers’ attempts to take over the house. The first attempt: At the beginning of the 1990s, the settlers of Elad association began to try to buy the house from their Palestinian owners. At first they claimed that the property owner, Miriam Siyam, who died in 1991, transferred her rights to three of her eight children. The three sons (who now live in the United States) sold their assets through a Palestinian middleman to the Elad Association. This claim was discussed in a lengthy and exhausting process in which it was finally determined that Miriam Siam had not transferred her assets before her death to her sons (a case in the District Court of Jerusalem, HC 325/96). At the trial witnesses testified that after the death of Miriam, during the preparation of the body for burial, one of the family members stamped her finger on six blank papers and told the family that he was doing this to protect her assets. It should also be noted that on the basis of the same argument of purchase, the settlers entered another house owned by Miriam Siyam in Silwan in 1997, which they call “the Aderet House.” However, since a legal battle against the settlers draws enormous resources from the family members and demands a great deal of money, the family was forced to concentrate its efforts on preventing the settlers from taking over another house and could not face another legal process for evacuating them from “the Aderet House”. The second attempt: At the same time, Elad tried to take over the second part of the plot on which another structure of the family was built, claiming that it purchased the second part from a relative of Miriam before his death. This claim was also rejected by the court (Case in the District Court of Jerusalem, TA 1185/96). The third attempt: After the settlers’ claim that Miriam Siyam gave her three children her assets before her death was rejected, the settlers claimed that they had acquired the ownership of the three sons, and that the other five daughters had all waived their rights to the property. The court ruled that the “waiver document” of the sisters was not valid and that ownership of the property was of all eight heirs of Miriam (Jerusalem District Court case, TA 1544-09). This means that as long as the settlers have truly acquired the rights of the three sons, they only have 3/8 of the property. During the hearings in the case, the settlers managed to buy from one of the daughters her rights and became owners of half (4/8) of the property. The current ruling: as a result, in 2012 the settlers filed a claim for the dissolution of a partnership and demanded to receive half of the property. In response, the Palestinians claimed that it was impossible to divide the property itself, and that as long as they wanted to end the partnership, the settlers could receive financial compensation for their share. The Involvement of the Custodian of Absentees’ Property – It turned out that two of Miriam Siyam’s daughters were considered absentees under the Absentee Property Law because they live in one of the Arab countries, and under the Absentees’ Property Law, the Custodian is the owner of their assets. 2/8 of the property – to Palestinian family living in the property. During the hearings, the Custodian announced that he had no interest in the property and that he intended to sell his share to the highest bidder, and therefore he published a tender offering both sides to compete over the purchase of the property. It is important to note that the person who lives in the property today, and whom the court ruled must vacate the house, is the daughter of one of the daughters that are considered “absentees”. But since under the Absentees’ Property Law, her mother is considered absentee – she has no rights to the property, even though she is a permanent resident of Israel. Also the son of the second daughter is an Israeli resident living in Jerusalem. This son filed a request to release his share of the property to him but the Custodian of Absentee’s Property rejected his request. In the tender, as expected, Elad won, despite the fact that the family tried to raise a large sum offered a very high price. Elad offered more than NIS 2 million (for 2/8 of the property). The result is that Elad now has a 6/8 ownership of the property and the Palestinian family only 2/8. In the ruling, the judge ruled that the property could be divided and that the settlers would be given an apartment and an office, while the remaining 2/8 would stay as part of the adjacent family house.